This morning, I’ve been sitting here thinking about Maggie’s Year and what a strange and surreal year it was. The trouble is that I was only seventeen and now I find that the true memories of that year have become clouded and mixed up along with impressions and emotions and even dreams such that the exact truth is no longer easy to know. What I do know is that I was too young to leave home. It was early September and I had just turned seventeen in July. Apart from a couple of hospital nights, here and there, I had never slept in any bed other than my own. No friend sleepovers, no evenings with Granny, nothing. And, yet, here I was waving goodbye to Mum and lugging my baggage through my small town to the train station and to the train that would take me to Dublin to live. Summer was over, it was time for college. I spent three years in college in Dublin. To the best of my knowledge, I was the youngest person ever to start my course and the youngest to ever finish it. That sounds lovely, and on many levels, it was but I was young and maybe a little too young. Not only was I setting off on my first solitary venture, I had no place to stay. I was booked into a B&B in Northside Dublin and there was a possibility of obtaining ‘Digs’ with an elderly lady within a couple of weeks. I sat on the train and read ‘Thin Air’ by William Marshall. The carriage was packed with the young members of a basketball team. I watched them laugh and jump around and thought about how they would be on the train back home again in the evening and I felt a not inconsiderable surge of envy about that. The B&B was almost too nice. For breakfast, they served me bacon and the cleanest fried eggs I had ever seen. There were three blonde daughters in the house and I feel in love with them in chronological order between Monday and Thursday. On the first morning, I walked to college. I came to a big road and knew that the college was in one direction and the airport in the other. I set off. The airport looked nice and I was late for my first lecture. 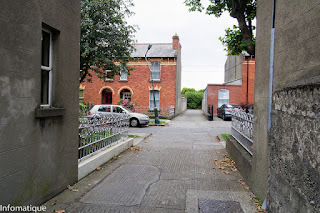 On Thursday, following a lead from a guy my parents knew, I walked up a typical residential street in Phibsboro looking for a house. In this house was Maggie. The house was dull and poorly lit and old fashioned and a bit ‘cabbagey’. From the doormat the hallway was so dull that I could hardly see Maggie inside. She bade me come in and I did. I stayed for the next nine months. It became ‘Maggie’s Year’. I may not remember it terribly well but I can never forget it. Maggie took in two of us. There was me and there was a fellow from Cork who looked, if anything, even more lost than I did. On Thursday’s, this guy and me would treat ourselves to the cinema and I would show him the scary stuff I had already seen over the Summer months. I loved how ‘Halloween’ terrified him and, in a rerun of Jaws at the Ambassador, in an auditorium that was murky with cigarette and dope smoke, I gleefully thought he was going to lose his life. The guy – I can’t remember his name – and me had a room each on the upper floor of Maggie’s House There was an upstairs bathroom, which was alien to me, and the rooms were dull and furnished with sold brown wardrobes that would kill you instantly if they fell on you. We got a breakfast and an evening meal, which was okay and in the evenings we watched a revamped version of ‘Quicksilver’ and other dubious stuff on the telly. Most weekends, I left Dublin on the bus and, during the week, my mind always registered the exact moment when half of my time away was over and I was again on the downhill road to going home. I loved college. It was full of people who seemed okay with being my new friends and there were new jokes and music and attraction at every corner. But, yes, I was young, and I missed my home and a part of me always ached to be back there. But, still, the days were fun and filled with companionship and learning. And, in the evenings, there was Maggie. Maggie was a short, stout woman who wore glasses which made her look like an owl. She seemed to me to be about seventy but I was only seventeen so perhaps she was only fifty. She was a country woman through-and-through. I have no idea how she wound up alone in a house in Dublin but there was nothing Dublin about her. She was feisty and opinionated and she loved her Gaelic Football. On the rare Sunday afternoons when I stayed in Dublin, she would be glued to her radio for updates on all the matches. She would whoop the good results and roundly curse the bad ones. Maggie was a good landlady. She looked after us well, if a little unconventionally. One Friday evening (I had stayed up for a party) she gave me a Valentine’s card to post. It was for my follow lodger in the house and it was from Maggie, albeit anonymously. “Look at the poor devil,” she said to me, “he needs a bit of encouragement’ I didn’t get one from her so I must have been doing better. I posted the card at the bottom of my street on the way to the party. There was a Saturday post so he would get it okay. It was Friday the thirteenth, the next day was Valentine’s Day. In a few short hours, a short way up the road, the Stardust Nightclub would be ablaze and forty eight innocent people would be dead. My housemate moved back to Cork. It was just Maggie and me then, toddling along together. Shortly after that, Maggie got sick and ended up in hospital for a month. At seventeen I became the sole proprietor of a run down house in Dublin. I remember eating a lot of takeaways and watching subtitled movies on BBC2 in the evenings. Then Maggie came home. She was very sick. She told me she was dying. People came in and saw to her needs. I saw to her needs when they weren’t there. Before my year was over she was gone from the house again, back into hospital. I used to visit her and tell her how the house was okay. I never met anyone else during my visits. Shortly after my Summer began and before I had even turned eighteen, she was gone for good. I think of Maggie often. She was my very first experience of living with someone outside of home. Alas, she also became my first experience of mortality. I am grateful to her. Sending me to college was no easy feat for my parents and the accommodation she offered was so cheap as to be almost miraculous. She got me on my feet in Dublin and probably looked out for me in ways I still cannot even comprehend. So here’s to you, Maggie. I’m better at Dublin now than back when we knew each other but, to be honest, I’m still a bit lost some of the time. Thanks for being my landlady. Amazing - what a year. You were braver then I was - I went to Rathmines School of Journalism & sat outside rather then go in to the interview.......and so stayed at hime for 3 more years. I was also about 17 and a week old, like you. The things we don't know about each other! I didn't know that and I reckon you didn't know this either - I didn't talk about it much. I would never have put myself down as braver than you, nuh-huh. I was still living at home at seventeen. I didn’t go to uni. My dad talked me out of it and I never forgave him. In later years he himself said he regretted not sending me (his choice of verb) which was a rarity; Dad was not one for apologising. I started work the day after I left school at sixteen and three months later I was unemployed and at a total loss with what to do with my life. I’d always wanted to be an architect. From the first day I sat at a desk in Techie Drawing I knew this was all I wanted to do. I know some kids dither but not me. But here’s the thing. Drawing in an office with pens not much thicker than a hair and drawing with a pencil are two different things. I couldn’t make the transition and I never forgave the school for not forewarning me. It was like being taught to juggle with beanbags only to find out you were required to use flaming swords. So I quit after three months or it might’ve been six. I quit before they sacked me and my boss admitted that was the way it was heading: I was neither quick nor accurate enough. (For the record I got 98% in my O-Level.) I was bereft. And it was the seventies too remember and jobs were hard to come by. So for a while I made my fortnightly trek to the labour exchange and wondered what I was going to do with the rest of my life. As it happens a family friend told me of a job in the civil service which I applied for and it turned out that I was even happier there pushing papers around than I had been in the architects. It was the perfect job for me. It was also where, a year later once I’d been promoted, I met the girl who was to become my first wife and, well, you’ve been reading my poems so you know where it went from there. My seventeenth year was really where I grew up though. I hadn’t realised how insular and parochial my life had been up until then.